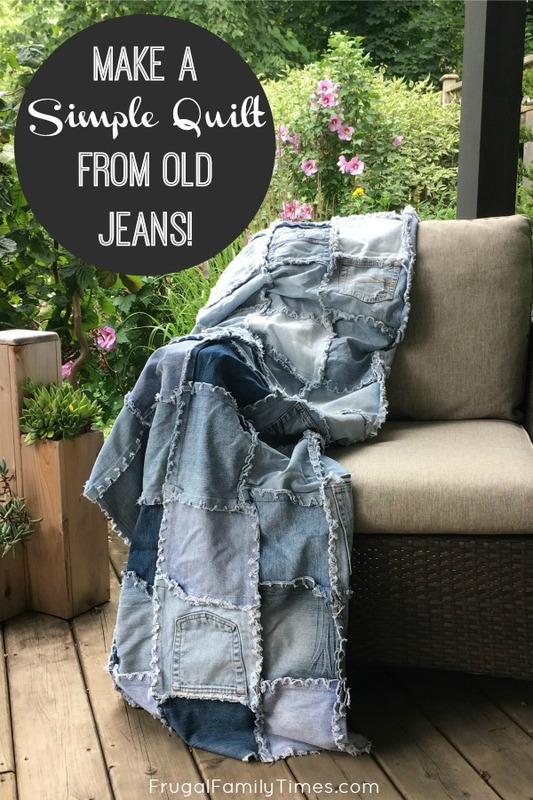 How have I not shared this recycled jeans denim quilt with you yet?!? It's one of my absolute favourites. It combines so much of what I love: making something beautiful and useful for very little money, using things that otherwise would be wasted. This craft is the essence of my eco-chic, frugal, creative, crafty ways. I made my first of these quilts many years ago - it was shortly after we added the enormous porch (and second storey addition) to our generational family home. My dad lovingly made us a porch swing - and I found a second-hand couch with cushions that I recovered in outdoor fabric. It's my favourite place. Especially in rainstorms. And when it's too cold to lounge on the porch - I needed a heavy blanket. Enter this perfect porch quilt made of my favourite fabric. I adore denim. 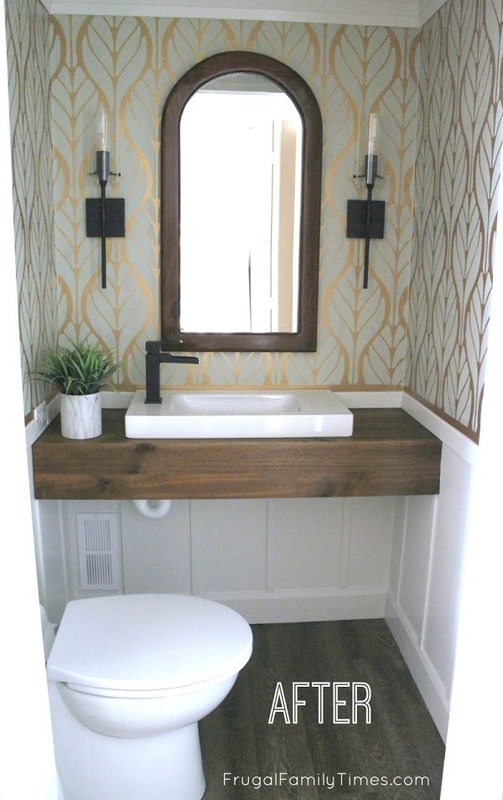 Maybe you've seen our daughter's IKEA window seat? 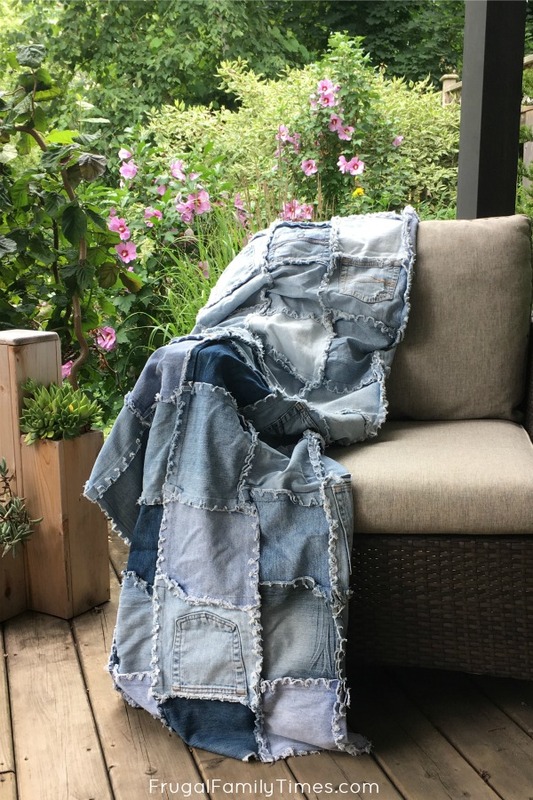 Together we made a DIY window seat cushion in a patchwork of recycled denim. I love it's deep and varied colour and rugged yet soft quality. 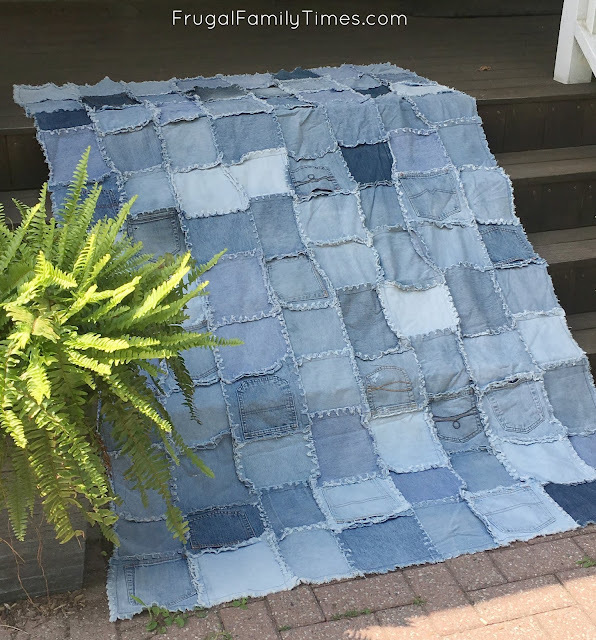 The quilt I'm sharing today was my first quilt and my first recycled denim project. It's perfect for cool evenings - and it makes a wonderful picnic blanket. It's thick and only gets more beautiful with many washings. If you are new to sewing - this is a fabulous project. It's affordable - just old jeans! And it's easy - straight lines that don't need to be perfect. If you look closely at my photos - you'll see some pretty subpar seams - it's totally doesn't matter - in fact it adds to the casual quality of this blanket. 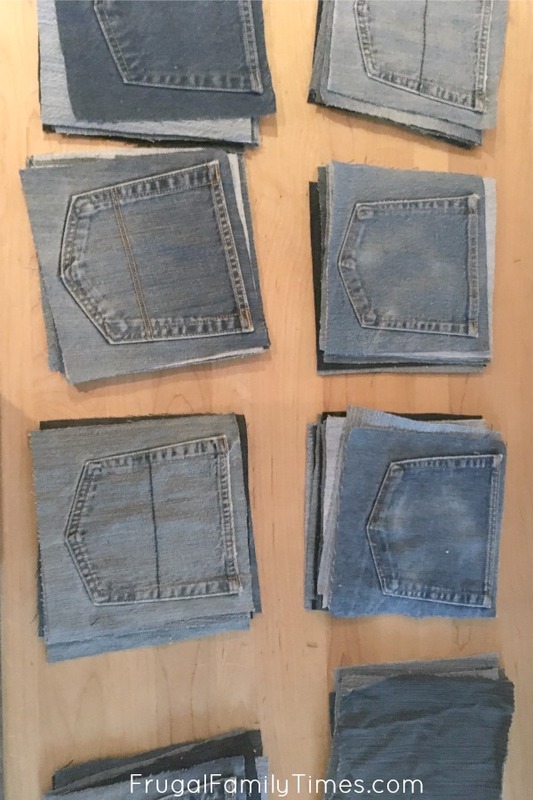 Old jeans - washed and cut into squares - mine are 8" by 8"
OR if you have an MCC thrift store near you - many of them carry precut squares of jeans - with a guaranteed number of pockets! I found mine for $20. 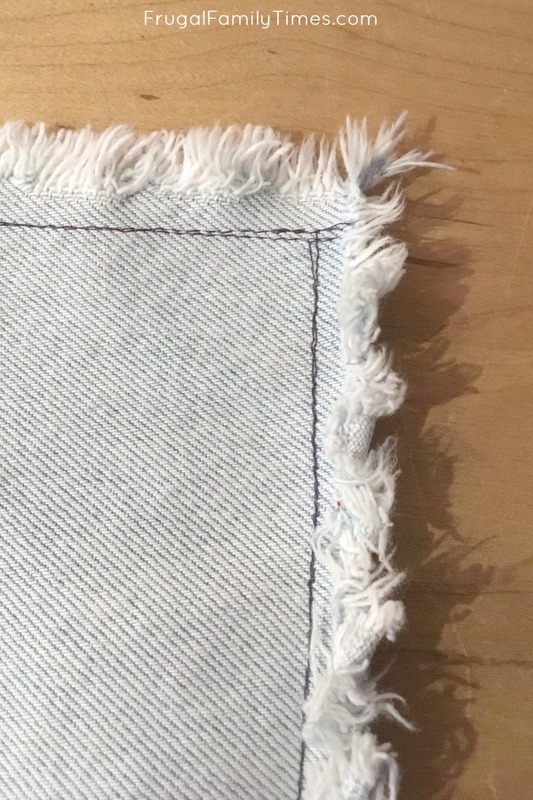 OR you can often find denim squares pre-cut from sellers on Etsy. 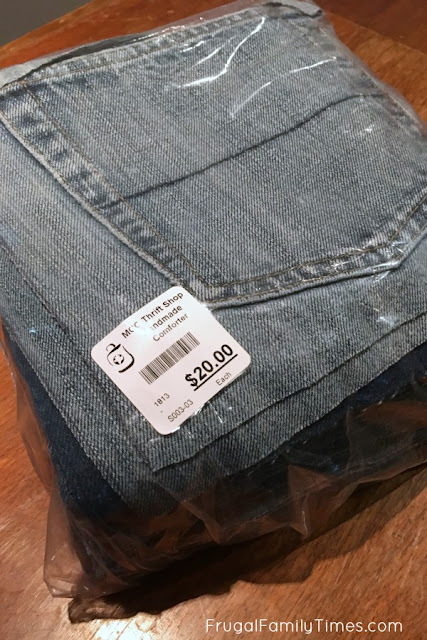 When thrifting for jeans - start in the largest sizes and work your way down - plus sizes usually cost the same - and will give you lots more squares. Be sure to get a mixture of light and dark coloured jeans. Jean trends have been leaning towards dark lately - so light are harder to find - but essential. 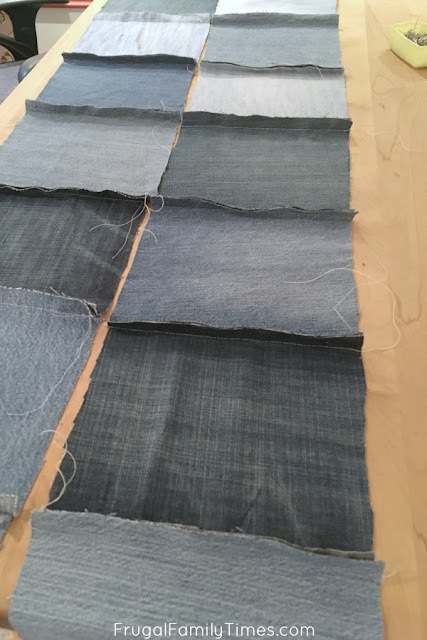 Decide if you want other colours of jeans in your quilt. I decided to only use blue - I had a few black squares that looked too stark for me in the quilt so I didn't use them. Too much stretch in a jean will make a wonky shape in your quilt. Old school jeans with little to no give will keep their shape better. If you didn't take the lazy way out and buy pre-cut jean squares - you'll need to cut your squares. I'd suggest making a template out of thick cardboard and tracing it. When cutting your pocket squares - be sure to centre the pocket really well. Some of my pocket squares had the top of the pocket so close to the edge that I had to sew the pocket shut. That just felt sad and wrong. 2. Plan your quilt - sort the squares. Sort your squares to make sure you've got enough. My quilt is 8 by 11 squares. Sorting also helps to ensure your colours of jeans are random. I know, sorting for randomness sounds silly, but it matters. 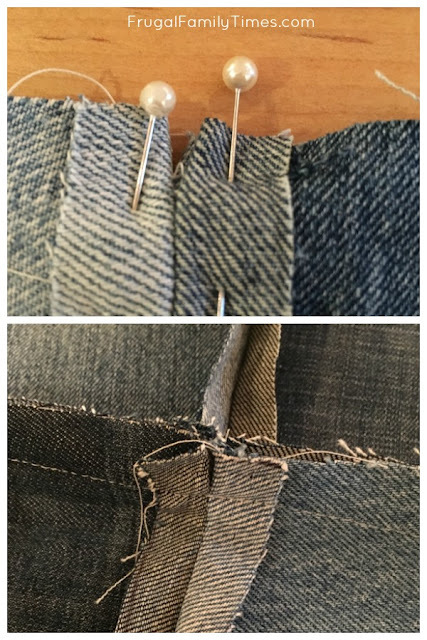 It will irk you to no end if squares from the same jeans are lined up next to each other - or at least it does me! 3. Sew your squares together. With WRONG sides together sew your squares together. I can't stress this enough - it's counter-intuitive if you're an experienced sewer, but for this quilt you want RIGHT sides out and WRONG sides together. Can you tell I made this mistake a few times? So frustrating! I made a 5/8" seam for all parts of this project. Sew your squares into rows. Then sew your rows together. 4. Prep and fray your edges. 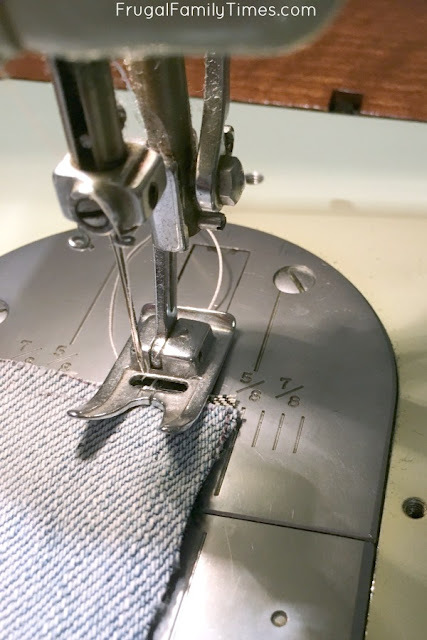 Sew a 5/8" line around the perimeter of your quilt. I went around twice to be sure. This will prevent your outside edge from fraying too much. 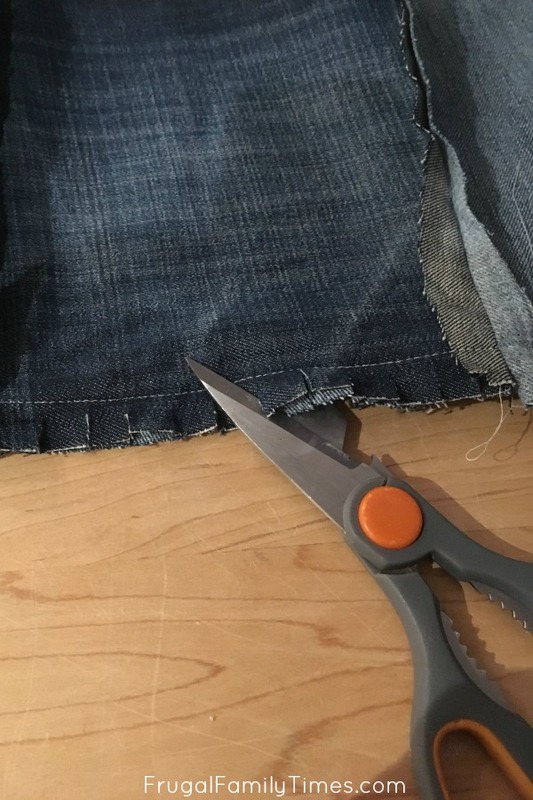 With the sturdiest scissors you have - cut all your seams. DON'T cut past your stitches - or it will fray too much and could fall apart. Also, make sure you don't use pinking shears - you WANT this to fray! I cut mine at about 1/2" intervals. Wash your quilt lots of times. Try putting it in the dryer with tennis balls and running shoes - this will help the seams to relax and fray. You may want to pick at it a bunch too. The more you beat it up the better! 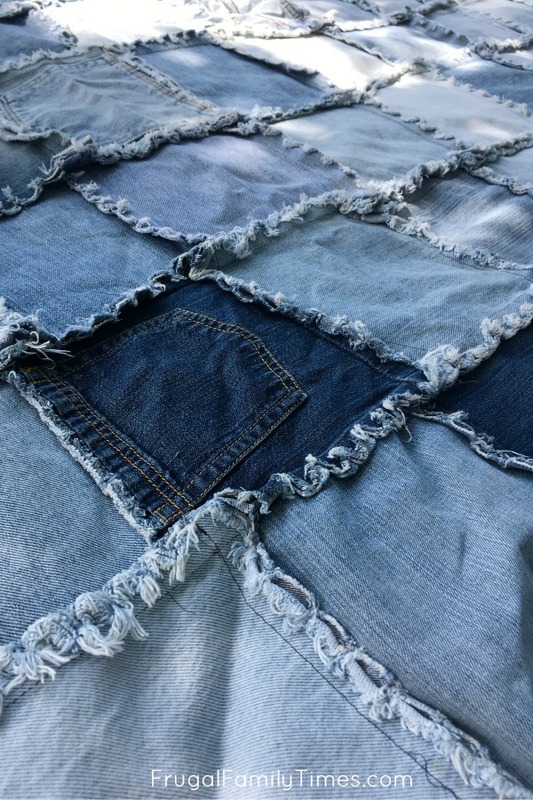 I hope you love your denim quilt as much as I love mine! If you have any questions about making yours, let me know, I'd be happy to help. We share so many simple and affordable Crafts and DIY projects here - you can see them all here. If you're looking for Easy Sewing Projects - I've got you covered here. Have fun! I love the look of this quilt. However, I am a bit confused (nothing new for me). Do you use a backing for this quilt?